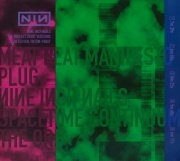 The Perfect Drug (also known as "The Perfect Drug" Versions, Halo 11), released on May 13, 1997, contains remixes of the title track, which was recorded for the Lost Highway Soundtrack. A sixth remix, by Aphrodite, is available only on the triple 12" DJ promo release, to date the only vinyl release of this Halo. The Aphrodite mix was also available to download at remix.nin.com. The original version of the song (from Lost Highway) is included as track 6 on the AU, EU and South African versions of this release. No version of this Halo was issued on cassette. The cover art for the 2 track promo release contains a series of numbers that correspond to letters of the alphabet and when decoded, they make the lyric phrase "without you everything falls apart". This page was last modified on 4 April 2019, at 22:50. This page has been accessed 120,854 times.